The market for western wear for the youngsters is seeing considerable growth. Capitalising the trend is 109⁰F, a brand owned by Creative Lifestyle. Mr Radhesh Kagzi, President of the company, speaks on their retail operation. Suranjana Basu (SB): In your long experience of about 20 years what sort of changes have you seen in the preference of the Indian consumers? Radhesh Kagzi (RK): There has been a tremendous change in the customer preferences and a shift from the traditional made-to-order garments to buying readymade garments. In the last 20 years, we have seen a lot of brands emerging. Now a customer is open to experiment and is willing to spend more and go to the next level. SB: 109⁰ F is essentially a brand for youngsters who are the current catch of the retailers. How do you like to differentiate the brand from others? RK: We provide a range of products across categories like tops, tunics, dresses, T-shirts, jeans, capris, shorts, skirts and evening wear. We also offer pre-winter and winter wear like flat-knits, sweaters and jackets. We want to be a one-stop shop for our customers to choose from our range. SB: The promoter group Creative Lifestyle has considerable presence in export. How retail is adding value to the business? RK: The Indian domestic market is growing at a high rate. This was the logical extension of our export business. We believe that we entered this market at the right time when there were not many players in our category. This timing and our strengths of exports have really helped and supported us. SB: How do you justify the tag international with 109⁰ F? What kind of international presence you have? Do you have foreign tie-ups? RK: We have our roots in the export business due to which we are constantly in touch with international fashion. Our team travels extensively and is accustomed to international trends and forecasts. We translate these trends into our styles. This way we are able to introduce international trends in the market. SB: The fusion wear is the new trend in India where western wear is mixed with ethnic wear, like jeans teamed up with kurta- your take on this! RK: This is an indication of the customer’s habit of going to the next level. This is a transition period. The customer taste and preference is constantly evolving. It has moved from ethnic to fusion wear. This is the phase and from here acceptance of western wear increases. SB: How do you perceive the market at presence? What is the growth projection for western wear retail? How did you fare last quarter? 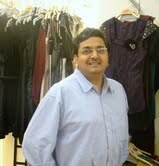 RK: I think that today the market is at the nascent stage and gradually the demand for western wear is growing. We have seen exceptional growth across all our formats and feel that we can grow three times in the next 3-4 years. We had a great last quarter with our sales growing by 40 per cent over the previous quarter. SB: For expansion how do you source funds? Is there any plan for private equity funding? RK: We are a cash rich company and use internal resources. SB: You have tie-ups with MBOs (Multi Brand Outlets). How do you select your retail partners? What are the parameters you consider before snapping tie-ups? RK: It is very important that the image of our MBO partner should be in sync with the brand image. We survey the stores and do our research about factors like standard, image, credentials, financial strengths, business capabilities of the store before we associate with them. SB: How do you promote the brands? What role these MBOs play in this regard? RK: We use various media for promoting our brands. We advertise through newspapers, fashion magazines and hoardings at prime locations in prime cities. We were among the first apparel brands to advertise on television on prime time across several lifestyle and popular channels like Colors, Star World, Zee Café, Travel & Living, NDTV Good times, MTV, Channel V among others. Our MBO partners also promote our brand in their Ad campaigns as this is for mutual benefits. SB: How many exclusive outlets you have? Tell us something about your plan for expansion. RK: We currently have 11 exclusive outlets operational across the country and we are opening the 12th one in Mega Mall Mumbai and 13th store in Sept. By the end of 2010, we will have about 20 operational outlets. Our outlets are in the cities like Mumbai, Delhi, Kolkata, Hyderabad, Bangalore, Pune, Amritsar, Jalandhar, Ludhiana, Siliguri, Ujjain, Nagpur, Kanpur and others.